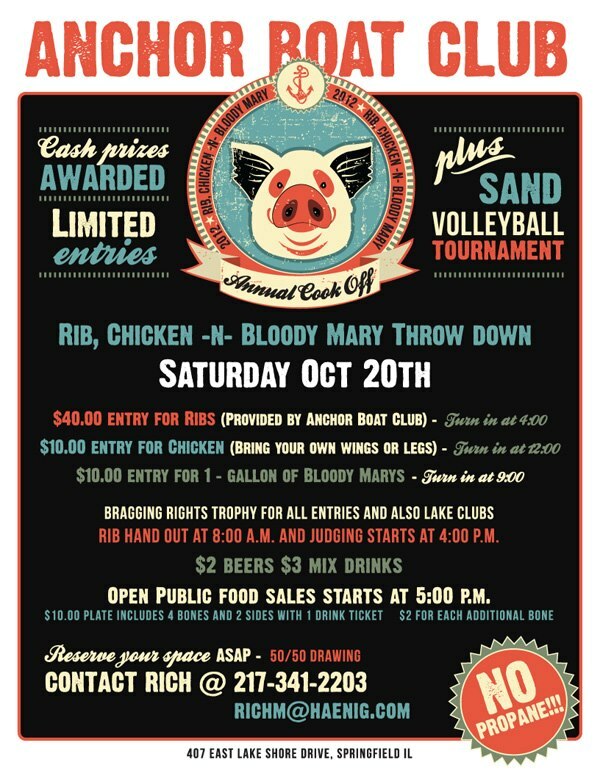 On Saturday, October 20th, the Anchor Boat Club will be having a Rib Cook-Off. Thirty different cooks will be competing for cash prizes and bragging rights with all entries ribs being available to the public starting at 5:00p.m. The day will start at 9:00a.m. 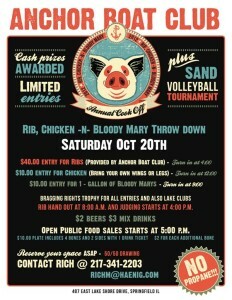 with a bloody mary contest and at noon chicken will be judged and available for public sale also. There will be a DJ all day and Big Daddy Jasper starts at 7:00p.m.. Come out and enjoy some of the best Bloody-Mary’s, Chicken and Ribs central IL has to offer. Tell your friends, the club is open to the Public ALL DAY.